Last Monday when I was checking my refrigerator I found some mozzarella cheese in my refrigerator. I bought mozzarella cheese with lasagna in mind, however it did not happen and cheese was staring at me every time I opened the refrigerator. My dilemma of what to do with the cheese ended in a cheese stuffed dinner rolls with 30% white whole wheat. 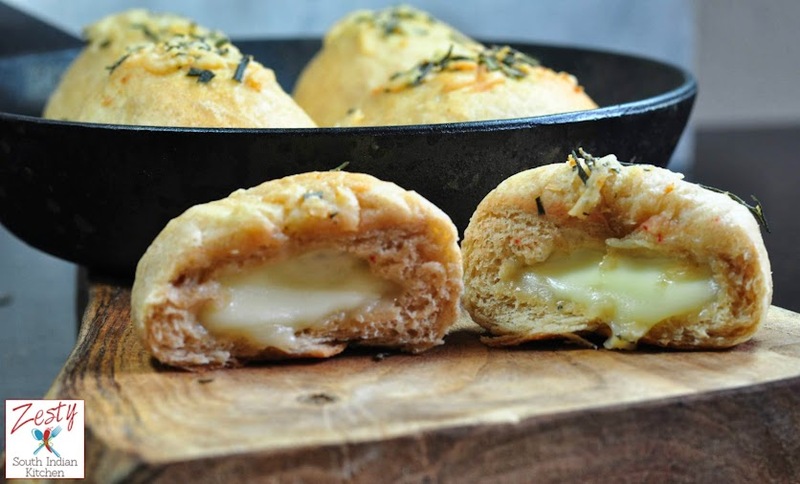 I have taken inspiration for this cheese stuffed diner rolls from here. 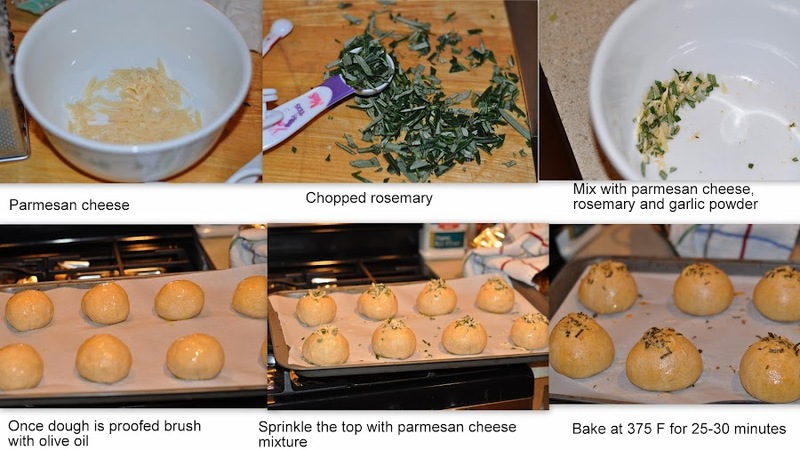 I think in order to make this dinner rolls/buns any melting cheese like mozzarella, cheddar, Provolone etc can be used. Do you know there different varieties of melting cheese, Stretchy and stringy melters like Mozzarella(aged and fresh) , Queso Oaxaca , Scamorza ,Provolone ,String cheese and Fresh cheddar cheese curds . They stay pretty much where we put them, without running all over the place, and they can form extremely long strings when pulled. Or if you want smooth flowing melters then use Asiago ,Cheddar , Emmentaler,Fontina ,Gruyère ,Havarti,Monterey Jack .Muenster,Gouda , Blue cheeses(they melt around the mold) and Soft-ripened cheeses like Brie and Camembert (the rind will not melt). Our Indian paneer, Halloumi, Mexican queso fresco and cottage cheese, ricotta, fresh goat cheese and feta are belong to non melters means they won’t melt due to their high whey protein content. The favorite Parmigiano-Reggiano belongs to non-melters as it requires some moisture to melt; if you add milk then you can melt them otherwise it remains as such. So it will be good a topping. If you want read more about cheese and its melting behavior read from here. First I made dough using all- purpose flour, white whole wheat flour, milk powder, potato flour, yeast, garlic powder, sugar and salt. I also used melted butter and canola as fat. Once dough was made, I allowed it to rest for about 90 minutes for first fermentation, as it was a cold day in Houston, you can adjust the time depending upon how fast it work. When added melted butter and water I checked the temp with my hand like baby milk test. However didn’t check with thermometer. Once I made the dough, when it touch it, I felt warm, so started panicking and wondered if I would killed my yeast. Then I check with thermometer and it was 89.9 ⁰F. Then turned to Google, and found that the optimum temperature at which yeast can do the fermentation is 80-90 ⁰F. I thus calmed down and once the dough doubled in volume, I cut the cheese in 12 pieces and stick it into twelve equal parts of dough. That was the fun part as my princess and prince joined the fun, and when I flattened each piece of dough they will put a cheese piece inside it. I set aside the dough for second fermentation for another 45 minutes or until the dinner rolls were slightly puffy. Most of the recipe I saw in the internet had only one fermentation step. 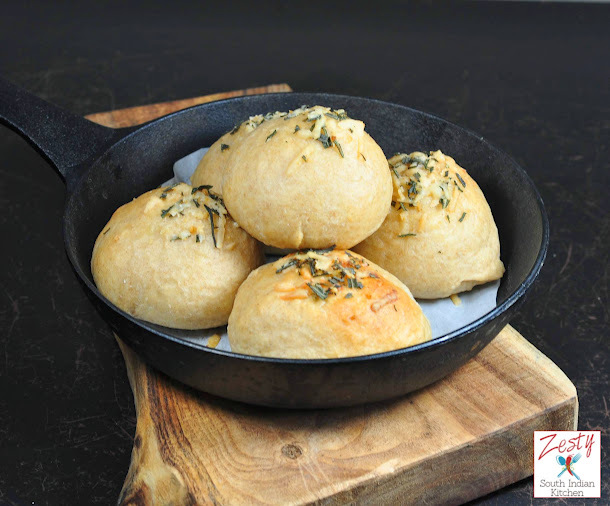 When it is ready to bake, I brushed the dough with olive oil and sprinkled some fresh rosemary garlic parmigano-regiano cheese on the top and baked it at 375 ⁰F for 25-30 minutes or until they were golden brown color. I used rosemary because I have bush in my backyard. If you want you can use any herbs of your choice. If you want little color to dinner rolls brush them with egg wash; I will do that next time and sprinkle with cheese on the top. These are delicious and are at prime when you have them while they are warm. You can also reheat them in microwave for 15 seconds and enjoy them. It is unique with its hidden cheesy marvel in its belly. Go ahead and try it with your own favorite cheese. 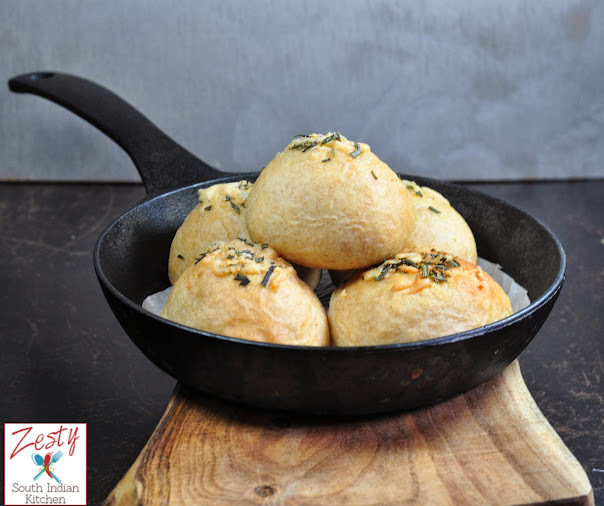 These are delicious dinner rolls, great for any time of the day. Here comes the recipe. Melt butter in microwave safe bowl for 30 sec. In a kitchen aid stand mixer bowl all every thing including melted butter and water and with paddle attachment mix well together to form a sticky dough. Then with dough hook knead the dough for about 7 minutes to form soft pliable dough. Set aside in well greased container for about 90 minutes to double in volume. While the dough is doubling cut 8ounce cheese into 12 pieces and set aside. 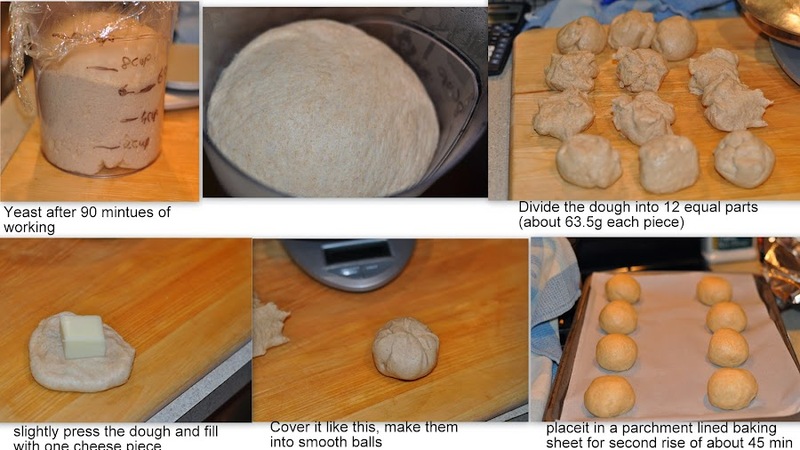 Once the dough(762g) is doubled divide it into 12 equal pieces ( 63.5g) pieces. Slightly flatten the dough balls and place the cheese and cover it well and make a smooth ball. set aide for doubling in baking sheet lined with parchment paper for 45 minutes. Once the dough is doubled again. Brush with olive oil and add topping and bake it in a preheated oven of 375F for 25-30 minutes or until it changes golden brown color. 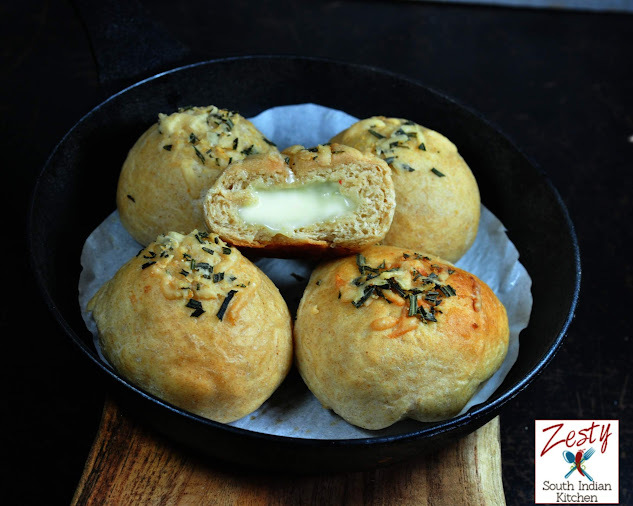 Enjoy the warm dinner rolls they are delicious with melting cheese. 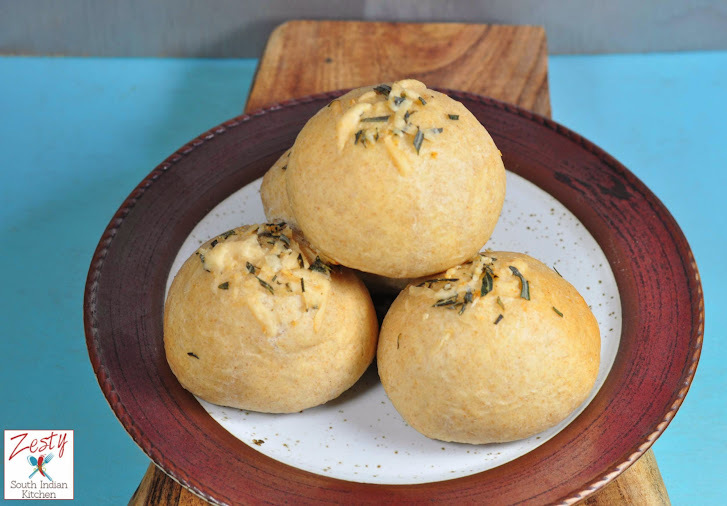 I am linking this delicious cheese stuffed dinner rolls to Yeast spottting. such a tempting bun Swathi, must try for kids!!! Liked the cheese stuffed inside will be a surprise treat for kids. Like to taste the soft buns with gooey cheese inside. Love love love these dinner rolls! They sound so good on their own. Great post Swati. Pinned! My heart melted like a mozzarella cheese of the Bun. Looking Great, I am sure the taste too. Looks very tempting and delicious, loved the shot with cheese oozing out. Wowww These buns look fantastic!